IBF superflyweight champion Jerwin Ancajas brushed off a bad cold and clobbered previously unbeaten Irish challenger Jamie (The Mexican) Conlan until New Jersey referee Steve Gray stopped the carnage at 0:52 of the sixth round before a hushed crowd at the SSE Arena in Belfast yesterday morning (Manila time). 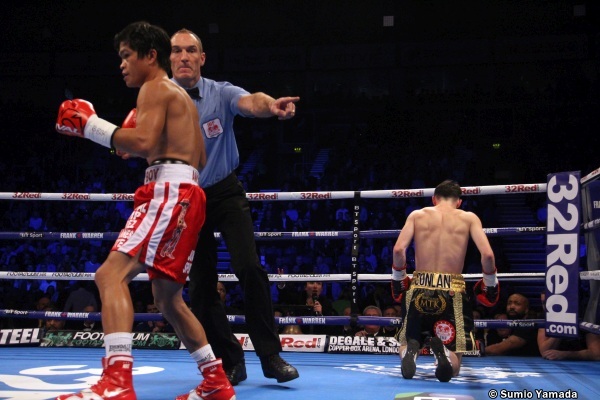 It was no contest from the start as Ancajas, making the third defense of his crown, brought Conlan down to a knee with a body shot in the first round. An accidental clash of heads opened a cut above Conlan’s left eye in the second then Ancajas dropped the Irish hometown hero with more body blows in the third and fourth. Another punch to the body floored Conlan in the fifth but Gray ruled it low and docked a point from the Filipino. In the sixth, Ancajas went for the kill and unleashed a vicious right cross to the head that sent a badly battered Conlan down once more. Conlan got up but Gray waved it off to spare him from further punishment. Filipino judge Silvestre Abainza said if Gray hadn’t stepped in, Conlan would’ve landed in the hospital. 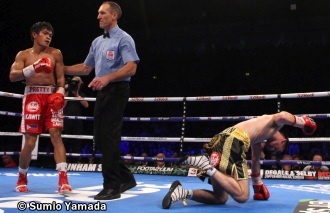 At the time of the stoppage, Abainza had Ancajas ahead, 49-42. The other judge Dave Paris of Leeds, UK, also saw it 49-42 while New Jersey judge John Stewart, a late replacement for Julie Lederman, had it 49-41. A boxrec website report made a mistake in naming Zoltan Enyedi of Hungary and Ingo Barrabas of Germany as the judges along with Abainza. Referee Steve Gray motions Jerwin Ancajas to go to a neutral corner after Ancajas sends his Irish challenger Jamie Conlan to the canvas during their IBF world title fight in Belfast last Saturday. Photo by Sumio Yamada. 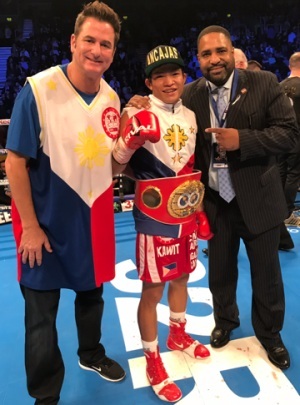 IBF president Darryl Peoples (R) and matchmaker Sean Gibbons pose with Ancajas after Ancajas successfully defended his IBF title Saturday in Belfast. Conlan, 31, lived up to his reputation as a warrior. He never backed down and fought courageously. Conlan could’ve run, boxed from a distance and fought cautiously. But he promised the hometown fans a brave stand and paid the price. Conlan was tailor-fit for Ancajas who had no difficulty finding his target. Ancajas, 25, raked Conlan with jab-straights in the middle of the ring then blasted the body when he pushed the challenger to the ropes or corners. There was no let-up in Ancajas’ assault. Abainza was isolated by organizers from Ancajas and stayed at the Park Inn Hotel, about a 15-minute walk from where the champion and his traveling party were billeted at the Radisson Blu Hotel. IBF president Daryl Peoples acted as fight supervisor. Abainza said from his viewpoint, the low blow that Gray called to deduct a point from Ancajas was legal. “Sa tingin ko, legal blow yun, tumama sa bodega,” he said. Conlan, known as “The Mexican” because of his bell-to-bell style, was clearly not in Ancajas' class. In three previous bouts, Conlan survived trips to the canvas to win but this time, the Filipino never gave him a chance to recover. Ancajas raised his record to 28-1-1, with 19 KOs while Conlan’s mark dipped to 19-1, with 11 KOs. Ancajas, Abainza and Jimenez will arrive in Manila on board an Etihad flight this afternoon.